It is 11 pm in Guatemala. We just arrived home from a very full and unforgettable day of serving, touring, shopping, laughing and eating together. Our team members are packing their bags as I type and preparing for an early morning departure. This morning we gathered together for a final team meeting to process all that the Lord has done in our midst. We addressed the "re-entry" challenges that we will face as we return home and talked about how our lives will be different. After our gathering we visited a number of families from Art and Lisa's ministry. We shared many emotional moments as we talked and prayed with these remarkable families, who have been so deeply impacted by Art and Lisa's work. It was truly a privilege to see the joy on the faces and hear the gratefulness in their hearts as we brought gifts, heard stories and blessed their homes in prayer. This afternoon we drove into the picturesque city of Antigua, which is lined with cobblestone streets and brightly colored buildings. The unbelievable mountain views of the city with the ominous volcanoes in the background took our breaths away. 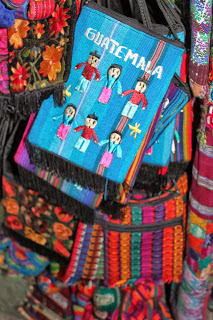 We enjoyed shopping for gifts in a local "mercado" (market), where the bright colors of Guatemala are undeniable. Our "Thanksgiving Team" finished the evening celebrating a delicious meal while watching an indigenous Guatemalan musical performance at a quaint restaurant, nestled in the ruins of a 500 year old presidio. 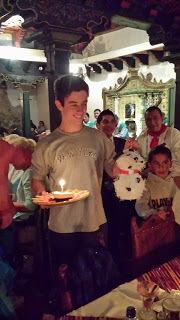 Jackson May will turn 16 tomorrow and it was a joy to celebrate his birthday with him. We are so thankful for all that God has done among us this week. As the "Thanksgiving Team" leader, I am overwhelmingly grateful that God has allowed me to serve alongside such a wonderful team this week. This is my thirteenth trip to Central America and I will never forget this Thanksgiving week in Guatemala. Thank you for your support, prayers and eternal investment into the lives of the Guatemalan people!